If you are one of the millions of people who uses the Mozilla Thunderbird email client, there may be times when you want to save an email message outside of Thunderbird as a separate file. This is easily done. 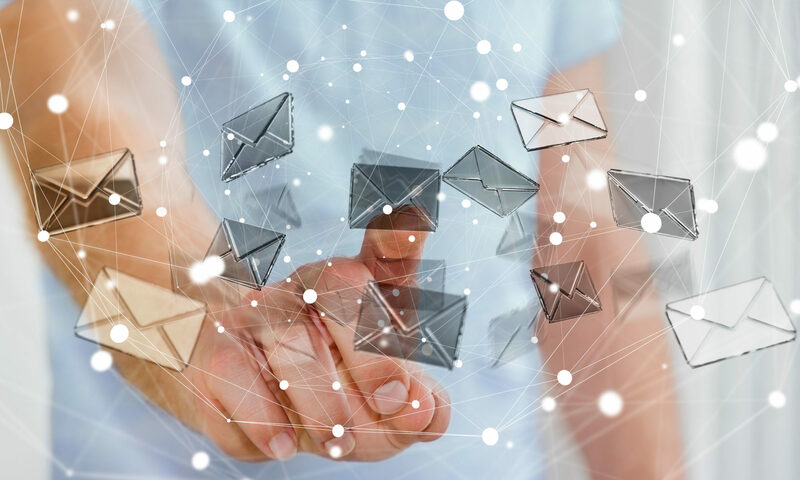 This article will show you two simple ways to save a Thunderbird email message as a .eml file that can be shared separately from your entire inbox. If you’re in a hurry, watch the short-cut video below. Method 1: Simply drag the email message from the Thunderbird mail list to the Windows desktop. Thunderbird will create a .eml file on your desktop. The email’s subject line will become the name of the file. 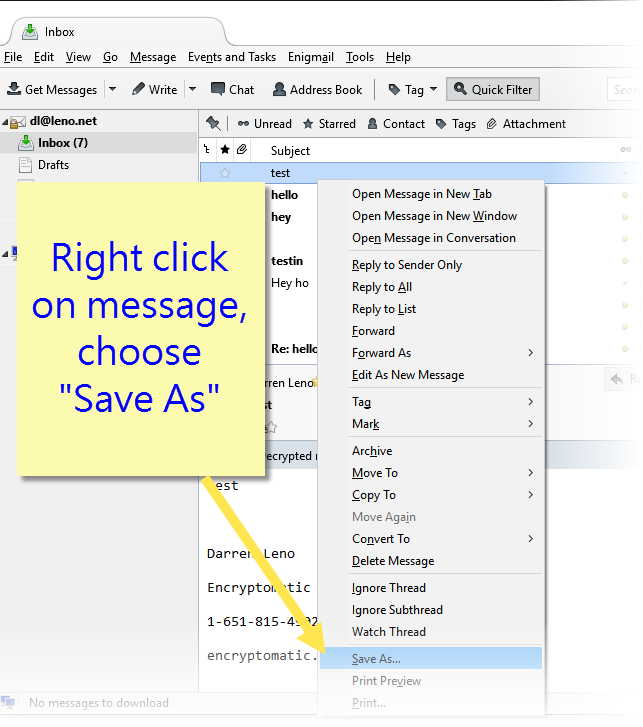 Method 2: Right click on the email message in the Thunderbird maillist, and then choose “Save as” and enter a file name. Right click on Thunderbird email to “Save As” .Eml file. 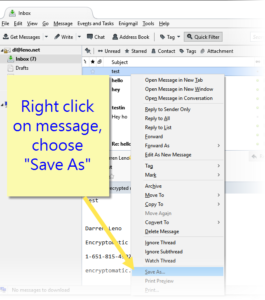 That’s how easy it is to save a Thunderbird email as a .eml file. If you have lots of .eml or .msg email files to manage, download a free trial of EmlViewer Pro. This Windows email viewer that lets you view, sort, search, print and convert Thunderbird .Eml files to PDF and other formats. If this has been useful, please post in the comments. Tell us about any other email conversion issues you are having, and we’ll be glad to help. Converting multiple .eml email files into a .csv file for import into a spreadsheet app. Eml email files can be converted into a .csv (comma separated values) file using EmlViewer Pro. The .csv file may then be imported in to a database or spreadsheet application. The various values of the .eml email will be separated into different columns, which is useful if trying to extract email addresses. EML, which stands for ‘E-mail’, is the file extension of the Outlook Express Saved Mail Messages files. It belongs to the Microsoft range of e-mail management programs and is used for saving e-mails for storage and forwarding purposes. EML is a file extension for an e-mail message saved to a file in the MIME RFC 822 standard format by Microsoft Outlook Express as well as some other email programs. Files that contain the .eml file extension are email files that have usually been sent or received by a POP3 email application. CSV (“Comma Separated Value”) file format is often used to exchange data between disparate applications. The file format, as it is used in Microsoft Excel, has become a pseudo standard throughout the industry, even among non-Microsoft platforms. A CSV file consists of any number of records, separated by line breaks of some kind; each record consists of fields, separated by some other character or string, most commonly a literal comma or tab. CSV is a common, relatively simple file format that is widely supported by consumer, business and scientific applications. One of its most common usage is moving tabular data between programs that natively operate on incompatible (often proprietary and/or undocumented) formats. This works because so many programs support some variation of CSV at least as an alternative import/export format. For example, a user may need to transfer information from a database program that stores data in a proprietary format, to a spreadsheet that uses a completely different format. The database program most likely can export its data as “CSV”; the exported CSV file can then be imported by the spreadsheet program. For those who just want to get to the point quickly, here is the essence of converting a .eml to .csv with EmlViewer Pro. Simply highlight the selected emails from the mail list, choose “Export to CSV” from the drop down list, and then click the “Export” button. Export profiles can be configured to do many different things. Any of the existing export profiles in EmlViewer Pro may be configured with additional settings and parameters. You can also design new profiles to meet your custom requirements. The rest of this article explains the process in fine detail, and demonstrates exactly how to configure a csv export profile using EmlViewer Pro’s export wizard. To begin converting the EML file into CSV, start the program Eml Viewer Pro. On the left extreme right below the status bar and tools, you will find an explorer tree where you choose the windows folder which contains the emails stored in .eml format (Not to mention that Eml Viewer Pro can also open .pst, .ost, .pst, winmail.dat, and even .mht files as well and it’s a six viewer in one). From Email Explorer, select the emails you want to convert. If you want to convert just one email, just select that email. If you want to select a range of emails in that folder, hold down windows shift key to select those range of emails. And above all, if you want to convert all the emails in that folder, press control-A to select all of the emails. The selected emails will be highlighted. You can select random emails in a folder at one time too by pressing ctrol and clicking on the desired emails whose format is to be changed. .eml files listed in EmlViewer Pro. Now the selected emails to be converted are selected. Since the desired format is .csv format, we will need to choose the “Export to CSV” profile. To do so click on the “New Profile” icon given in the Tools below the Status bar. This same option of “New Profile” is also given in the “Export” heading in the Status bar. On clicking “New Profile” a new widow pops up named as “New Export Profile Setup”. Creating a csv export profile in EmlViewer Pro. Once “New Export Profile Setup” window appears, click on Next. A new window will prompt on your screen asking two things; the new profile name and the export profile format. Give any desired profile name such as “into CSV” for my case and select the export profile format as desired which is CSV format currently. Once you have done this, click on Next. Setup of .csv export profile. On clicking next, a window appears which asks you to select the folder in which exported items (converted items) are to be saved. There will be another option, if to save the exported file in a direct folder or in a zipped folder in compressed form. This is for you to decide. Once you do this, click on Finish. Setting up a .csv export profile in EmlViewer Pro. Eml Viewer Pro export to csv function. The task has of converting the file extension from .eml to .csv has been finished. The selected emails .eml format have been converted into .csv format. The export folder that you selected contains the converted items. Now the next task is to import these csv files into Microsoft Excel. As it has already been mentioned that csv files generally contain tabular data that can be best manipulated and displayed via Microsoft Excel. Open the Microsoft Excel, any version would be equally compatible. You will need a blank workbook open. Go to menu >> Data >> Get External Data >> Import Text File. (If the menu options are greyed out this could be because you do not have a new workbook open). Now select the file you have just converted into csv from eml format. You may need to set ‘files of type’ drop-down box to ‘All Files ‘ to see your file. Having selected your file click ‘Import’. A new window of Text Import wizard at step 1 of 3 will appear on screen. Ensure that the ‘Delimited’ option is selected. The other option is Fixed Width which is rarely to be chosen. Click Next. Step 2 of 3 in Text Import Wizard appears. In the delimiters section tick ‘Comma’ (Sometimes comma is not the separating variable, the separating variable can be judged easily from the csv file preview at the bottom of this Text Import Wizard). The text qualifier box should show the double-quote symbol. Click Next. Step 3 of 3 in Text Import Wizard appears. 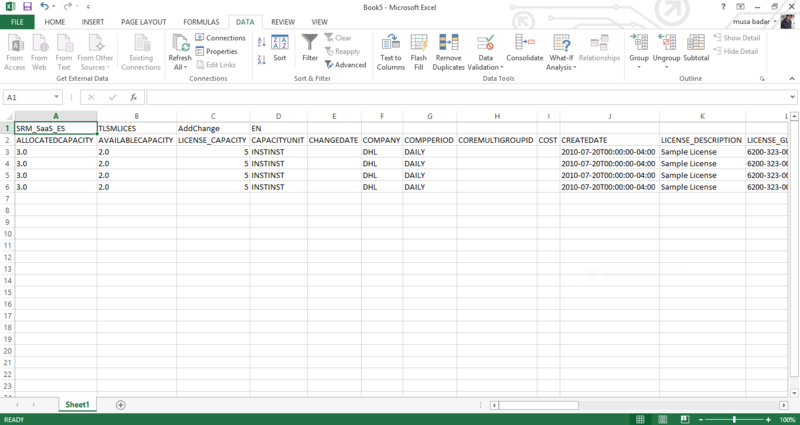 You now need to set every column to be data format ‘Text’. The first column will initially be highlighted. Move the horizontal cursor as far as it will go to the right, and holding the shift key down, click the column heading on the very last column. You should now have every column highlighted together. Click the ‘Text’ data format. It will now say ‘Text’ in the header of every column. Click Finish. It may ask you ‘Where do you want to put the data?’. It will allow you to click into any cell on the blank worksheet to determine where the data should go. Click ‘OK’ to proceed. The data should now appear in the spreadsheet. Where column headings are included these will appear in the top row. Check that fields have not lost leading zeros where applicable. For more information about EmlViewer Pro and a free trial, go to the EmlViewer Pro home page.